Beadboard is meant for more than walls! While using Beadboard as Wainscoting is the most common use, there are many other traditional (and a few non-traditional) uses for it as well! Recently, we've heard from many of you that are using our Beadboard and V-Groove in custom cabinets that you're oftentimes making yourselves! Wow! "Here are the kitchen cabinets (above) I am building to complete the remodel of our kitchen. The cabinets are constructed with high grade 3/4" birch plywood, hickory face and door frames, and your hickory/pecan V-Groove Board [in the] doors. I love the look and warmth! By the way, don't be too hard on me -- this is the first time I have ever built cabinets (or done any serious woodworking for that matter)." 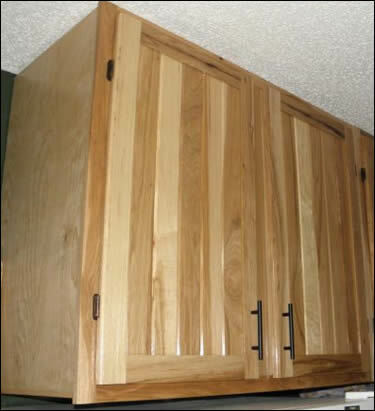 Another handy customer writes, "Here are pictures (left and below) of the (3-1/4" Cherry Beadboard) installed to finish off the back of the cabinets under my kitchen peninsula. I am very happy with the product. Very good, consistent, and no defects. I can highly recommend your materials." 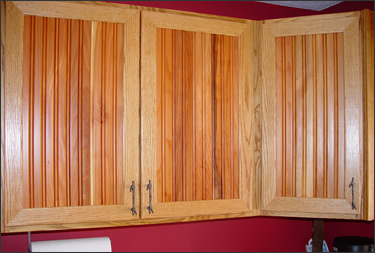 Perhaps you can save money by replacing standard cabinet doors with new Beadboard doors if the rest of your cabinet box is in good shape. 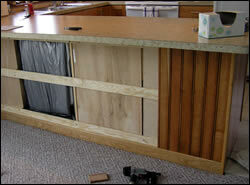 Or, perhaps you can even re-use the cabinet door frame and replace only the center portion. What a cost-effective transformation that could be! 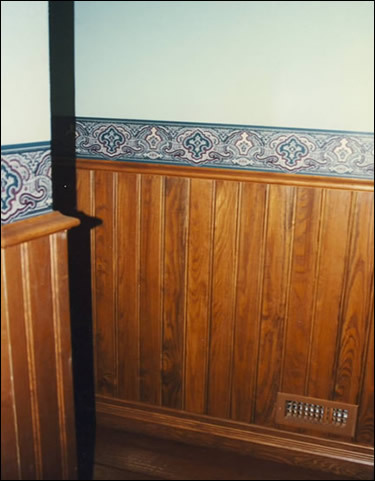 Read the Archives... Read more about Wainscoting in our August 2012 Newsletter. We have 480 standard combinations of Thickness, Width, Material (including 19 wood types and synthetics), and optional Extra Center Bead! Plus, custom widths are also available, so the possibilities truly are endless! Yes, we can match almost any existing Beadboard or V-Groove board. A very happy customer sent the photo above and writes, "Look how perfectly the new wood matches my old wall! When I paint it white, no one will ever know there was a doorway there!" We offer samples of our Beadboard and V-Groove so you can pick the perfect combination of material, width, and thickness. We'd love to hear from you, so please send us your feedback and/or photos! "Our new kitchen cabinets were completed and installed after a lot of 3D CAD work and a lot of hands on work. The boxes are of ¾” birch ply sides. Face frames and door frames are red oak. 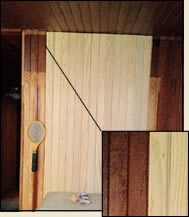 Door panels are ½" thick Redwood Bead Board (custom width bead spacing) purchased from Vintage Woodworks. Awesome!!" Where does your house need some Beadboard or V-Groove Board? 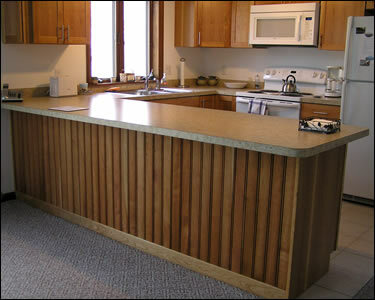 Browse all Beadboard / V-Groove Photos for other uses. Send us your photos of your Beadboard and V-Groove Board projects!